I only discovered back in 2016 that the first time sepsis struck was back in September 2011 when I had just moved to Southern Spain for the winter, with my youngest daughter. Since 2011, I have now battled sepsis for a total of four times! I had picked my daughter up from school and the pain had slowly worsened throughout the afternoon. Arriving home with my daughter, I was overtaken by an overwhelming feeling of being so very unwell, feverish and struggling to function. I had to lay down, thinking if I did I would feel better. As the evening progressed, I eventually realised that I seriously needed to get help as I lay there in bed shivering violently with what I now know was rigors! Eventually, and trying not to panic my daughter, who was then just 12 years old, I told her that we needed to call upon the neighbours for some help. We arrived at their door late at night with me, by then, vomiting with fever, shaking violently and near collapse! Emergency paramedics were called by these wonderful neighbours and thankfully I was given intravenous antibiotics, there and then, in their apartment! I made the difficult decision not to go to hospital at the time, as I didn’t want to leave my youngest alone, despite the neighbour’s offering to care for her. I miraculously managed to remain stable enough, (following that large dose of IV antibiotics), to drive to the airport and fly back to UK. The GP I saw, upon my return, had prescribed just oral antibiotics and had failed to identity the sepsis that was taking over my body. Luckily my son found me when he returned home from work late evening and I was rushed to A&E by ambulance and pumped full of various IV drugs, fluids, and 4 types of antibiotics. I was treated on different wards for 5 days with continual IVs of antibiotics. I can’t remember too much about it all as I was confused for a lot of the time, but I’m so grateful to have survived!! This time I was just told that I’d had a very bad infection that had gone to my blood stream and had started shutting down my major organs. I experienced three subsequent episodes – one in February of 2013, a second in November of 2014, and a third in December of 2016. In Feb 2013, I had a minor sore throat and which developed so quickly, within 24 hours, in to what I thought was just a chest infection which then developed in to what I now know was bilateral pneumonia. (Sepsis and Pneumonia) Again I became so very ill so very, very quickly and within hours I collapsed after foolishly waiting throughout the night before I asked for help! I experienced all the same sepsis symptoms, but this time I couldn’t breathe properly and spent many days on continual oxygen and was once again treated for at least 5 days on an AMU ward! On November 5th, 2014 I collapsed at a GP surgery. I had felt unwell for at least a week prior, but I couldn’t get an appointment to see a doctor so had no other option other than to arrange a telephone appointment for later that day. I yet again started feeling so very unwell and went ‘downhill’ very quickly. We eventually managed to get a doctor to agree to see me at my local GP surgery just a few doors from my house. It was there that I collapsed after trying to convince the GP that there was something terribly, terribly wrong with me. By then I was shaking so uncontrollably and couldn’t stop vomiting. I had an extremely fast heart rate of 135 plus and breathing so very quickly. Eventually, she rang for an ambulance and I was blue-lighted to A&E! I spent 4 hours in resus on that occasion whilst they stabilized me and did various tests and scans. I was treated with 4 types of IV antibiotics once again along with an additional very strong new antibiotic that they apparently only use when necessary and eventually I was transferred to AMU. It was only then that I saw the word sepsis for the very first time on the discharge summary, but I still had no understanding of what it meant! I sought guidance and support from the UK Sepsis Trust after searching online for further clarity and information on what exactly sepsis was…?! My most recent and fourth episode of sepsis was on 15th December 2016 when I collapsed at home. I was recovering from what I understood to be a very bad viral infection with an awful bronchitis type cough. (Sepsis and Viral Infections) Yet again I was unable to get an appointment to see a doctor but instead prescribed a course of oral antibiotics over the phone, just in case. I then became extremely unwell and was taken to hospital at the request of the GP this time. I wasn’t kept in but allowed to return home later that night after being told it was just a bad virus. I spent a week or so poorly in bed, and eventually, I seemed to be recovering well and started to get back to normal, or so I thought. Suddenly, I began to feel increasingly unwell with very bad upper back and shoulder pain which started to affect my breathing! I had now begun to recognize the all too familiar feelings that had struck me previously and I just knew that I needed medical help! My daughter rang an ambulance, and once she had told the 111 operator the symptoms that I was now experiencing they sent an ambulance out immediately. I can’t remember too much after that, but I was rushed straight through to the ED and whilst I apparently didn’t initially score too high for sepsis they treated me with IV fluids and antibiotics, painkillers, and various X-rays and scans. Again, I remember feeling that I was going to die and had the most horrific stabbing pains imaginable in my head – I was screaming out in pain and begging my daughter to make sure they didn’t let me die! They couldn’t determine if the chest pains were pneumonia, pleurisy and even checked me for a heart condition. They never found out what the horrific stabbing head pains were, but I was told that I was septic! Eventually, after a few hours, I began to feel a little more alert, as I had responded well to the IV antibiotics and fluids once they kicked in. I was transferred to AMU where unfortunately, one of the IVs blocked and tissued badly and caused circulatory problems to my hand and for a while I lost any feeling. As it was my left arm they were concerned about any potential heart issues and did further tests. Eventually circulation and feeling returned (but I was left struggling with very bad nerve pain for over a year). So, after five days of IVs, antibiotics, fluids and CT scans with moves to two further wards (with the most amazing nursing and medical staff), I was just so very grateful that I was then medically fit enough to be discharged (the discharge summary confirming that I was ‘admitted with sepsis’). Whilst I returned home still feeling extremely poorly, exhausted and weak, I was just so very, very grateful to everyone who responded so very quickly to halt the sepsis and helped me to recover in time to be home with my family for the holiday period. Unfortunately, I’ve been left both physically and emotionally affected by sepsis and I now live day to day with a fear of reoccurrence. I have extreme bouts of exhaustion and fatigue and I’ve experienced very low mood at times and mood swings. Socially I have found that I’m withdrawn and dislike crowds and noisy places now. Many of my senses have changed too including my hearing and taste. My short-term memory is awful and quite concerning at times. I now have problems with significant muscle inflammation and extreme lower leg pain and struggle to walk at times and have to try and keep my legs elevated to help cope with the pain, along with various other physical and emotional symptoms, which I’ve been advised are attributed to the post sepsis syndrome. (Sepsis and Post-Sepsis Syndrome) Things are slowly improving in some areas, not so much in others, and I now have to take things day by day. But I am determined to take back my control with regard to finding different treatments and therapies that can help me to heal and move forward. An example of this is recently starting intensive oxygen therapy and hoping it may help somewhat. Even though life can feel impossibly difficult and complicated at times, post sepsis, I celebrate my life and my survival every single day. I feel blessed each and every morning that I wake up. I am so grateful, as I know that I am one of the lucky ones. I have certainly noticed a huge difference and vast improvement this time in the awareness of sepsis in the first responders who now carry sepsis 6 information and use a sepsis scoring system (NEWS) in the ED. These improvements, I believe, is helped by the fantastic work of the Sepsis Trust and others around the world. There are, of course, still many areas of concern out there and sepsis is still being missed and there is still a need for improvement in some areas. 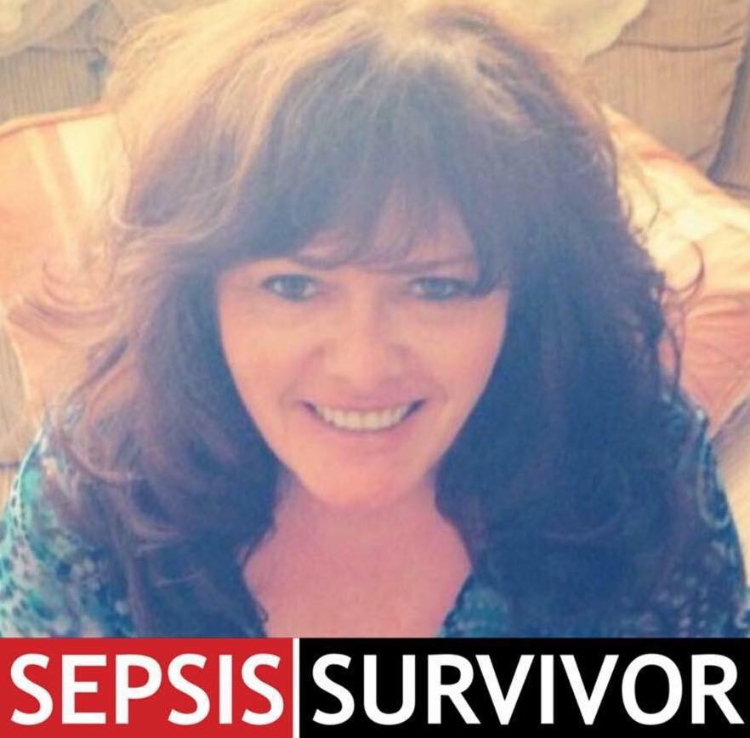 The ongoing fight to keep raising awareness will continue by many, including me, and I love to use my past work experience to help provide more support and create more support groups for those left affected by sepsis…I really do hope that by sharing my story it will help raise more awareness of sepsis but also of post sepsis syndrome (PSS) too! I am determined to travel the world, despite struggling with mobility and other sepsis related issues and to meet as many other people affected by sepsis as I can, patients and professionals, whilst trying to help raise awareness whilst I travel. I’m selling my house to help fund this! I am really looking forward to starting this adventure and currently researching ways to travel with limited mobility and health issues as I do feel having nearly been taken by sepsis four times, I will fight even harder to make this dream come true and be true to myself, as a sepsis warrior!